I cannot believe how much time has gone by - 8 month's since my last post!!! Things have been extremely busy. At the new year I was given a promotion at work which has been great but there is now double the amount of work to do and almost all of the flexibility with schedule has gone away. This makes working in my shop during the week VERY difficult. 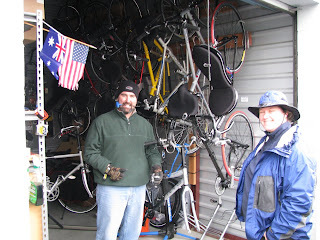 Since my last post my shop has been moved out of the garage and into a much larger building (rent free for now). 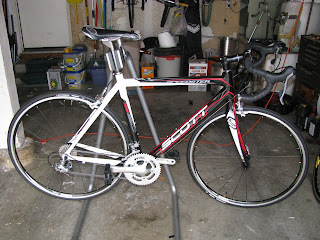 I completed my wife's road bike, my single speed, a road bike for my friend Azul, and a cyclocross bike for me. 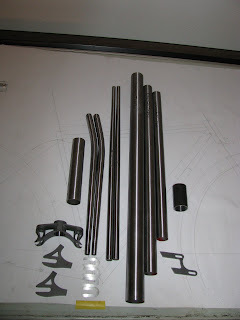 Today I spent a few hours assembling a crank forward bike that my friend Nanda, owner of SpinCyclz, gave to me a few years ago. 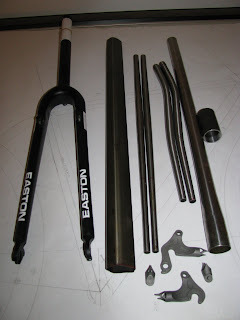 Part of the time I spent at his "shop" since he had a bunch of extra brake and shifter cables. Sue (my wife) was out for a walk at Shollenberger Park http://www.petalumawetlandspark.org/HTML/Shollenberger.html and stopped by the shop to get her ride back home. 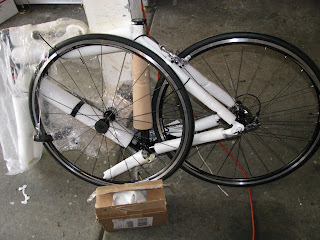 I had a Klein Quantum Race that met an unfortunate ending at a Crit race a back in 2002 (dented down tube) and decided to strip off all the components for the Zenetic. 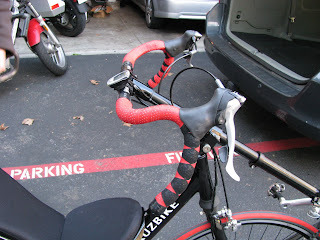 The Klein was just being used on an indoor trainer and was just about fully used up. 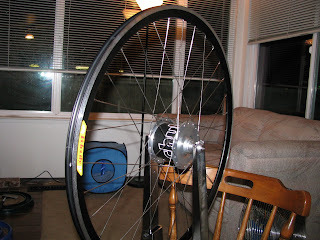 I built up a set of new wheels using some left over Shimano hubs and some Velocity Deep V rims in black. 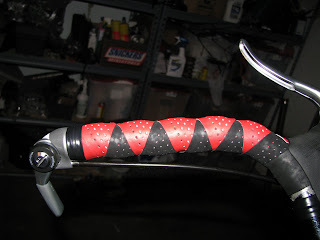 I tried something new on the lacing pattern; a 3-leading, 3 trailing pattern pulled off of Robert Torre's web site http://www.geocities.com/spokeanwheel/lacingcl.htm#3l3t and this site http://www.baldurdash.org/OtherStuff/3leading3trailing.html (nice basic pictures of the process and final results). I built up the rear wheel using the same pattern and am of the opinion that it was not the best choice. 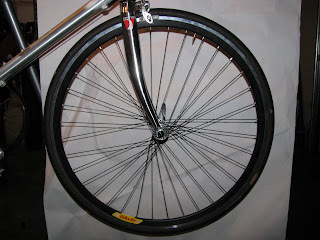 The spoke tension on the drive side is excessive and the spoke tension on the non-drive side is just barely acceptable. 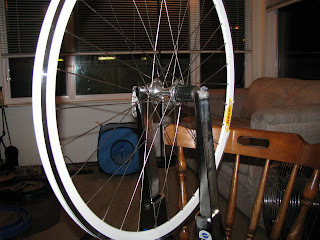 This wheel will probably not stay true very long, but it does look cool! 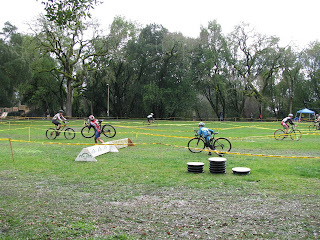 Today was my first time to a cyclocross race and let me tell you was it a bunch of fun! My wife, Sue noticed an advertisement in the Press Democrat (local news paper) and thought that it would be fun to spend the afternoon watching people ride in the mud. I have been to a number of Crits and road races, both as a spectator and as a participant, but this was the most fun I have had at either type of event. Sue and I arrived about half way through the first race (Junior C, Junior B, Men's C, and Men's Singlespeed) to a full parking lot. 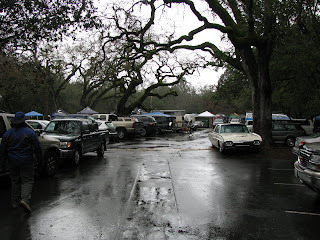 For Santa Rosa, California it was cold and wet (49F) and I really did not expect to see many people at this event. The second race to start was the Women's Singlespeed, Women's A, and Women's B - 15 women lined up for the start of this race. The woman at the far right in black with the white accents was the race winner by a good distance. 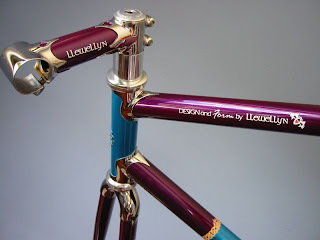 Sue and I thought that the most excitement would be near the start finish and the hurdles (which forced each rider to dismount and remount their bicycle) since we thought that the race course was flat. The first lap was the only time that the riders had difficulty with the hurdles and my camera was far too slow to capture any of the "action" - this was as close as I could get (the rider in blue was just about to go down.) 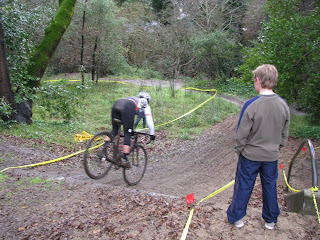 Shortly we were to learn that the race course had two very nice drops on the back side of the park. 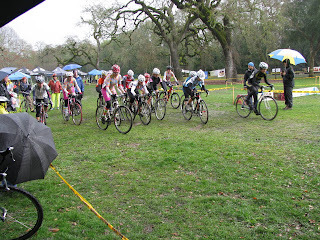 The next race was a 9 and under race that was free to enter and was a bunch of fun to watch and cheer on. 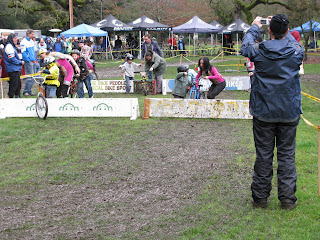 Some of the racers were out on course to help the smaller kids get their bikes over the hurdles. The most exciting race for me was the men's race, this one had the most crashing and a very large field with 2 full waves. Sue and I found a very nice spot to watch - located just at the end of a very muddy technical section (lots of crashing). Riders were falling going down the hill and then falling attempting to get back up the other side. 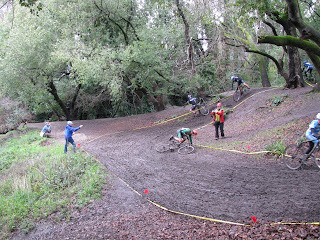 People were cheering and helping riders get up the "hill".